Electronic Winders Mod. SSW and SRW have been designed and built with the utmost technologies to meet all users’ requirements in winding operations. Speed (from 200 to 1200 mt/min), radial anti patterning system, counterweight and yarn tension can be adjusted easily and permit to obtain perfect packages. * Yarn passages protected by porcelain that avoid any rubbings. * Automatic threading of the tension / waxing device. * Mechanical yarn clearers with micrometric adjustment. The high quality of the materials used in the manufacturing process, makes the machine more solid and lasting in time. The maintenance is made easily and usually it is requested the normal cleaning only. Model SSW is suitable for preparing soft packages before dyeing with parallel and soft edges. The adjustable motorized yarn tensioning system and the axial movement permit to obtain soft packages with and excellent and uniform density. It can be supplied with “electronic tensioning device with feeder” (optional). 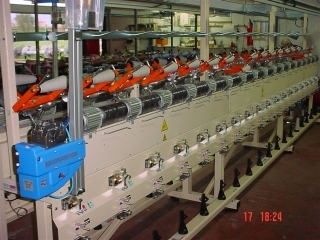 This device guarantees the utmost control of the yarn tension and consequently a better package formation and perfect evenness all over the package. There are no density differences among different sectors of the package itself and among different packages. Last but not least, the electronic control of the tension increases the productivity of the machine. Motorized waxing device (only model SRW).